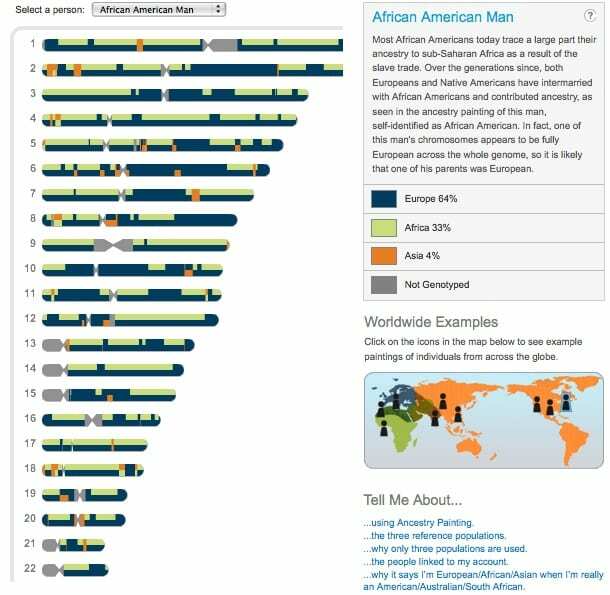 As shown in these ancestry paintings from 23andMe, the proportion of African DNA can vary widely for African Americans. A recent study led by Carlos Bustamante of Cornell and Sarah Tishkoff of the University of Pennsylvania has shown that genetically speaking, African American can mean a lot of different things. 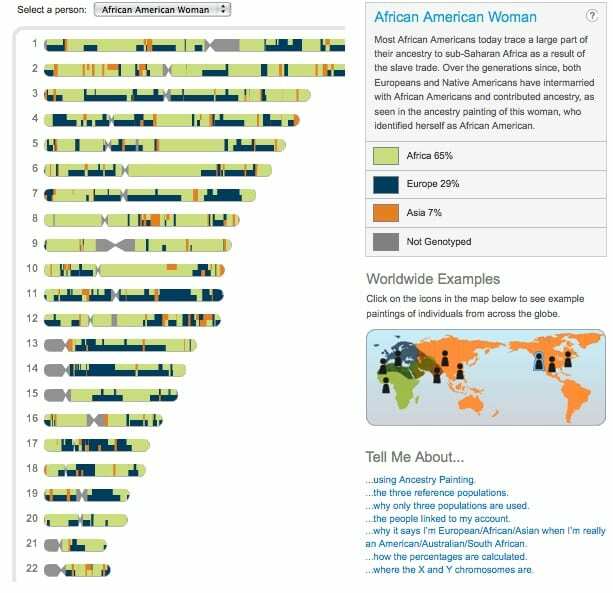 The researchers and their co-workers analyzed DNA data from 365 African Americans, 203 West Africans from 12 different countries, and 400 Europeans from 42 countries. Their results, published in the Proceedings of the National Academy of Sciences, show that the average amount of DNA in an African American’s genome that could be traced back to West Africa was about 77%, but ranged from as little as one percent to as much as 99%. These findings have important implications not only for understanding the ancestry of African Americans and the history of human migrations, but also for medical treatment. “That some individuals who self-identify as African American show almost no West African ancestry and others show almost complete West African ancestry has implications for pharmacogenomics studies and assessment of disease risk… caution should be used in prescribing treatment based on differential guidelines for African Americans, ” the authors write. The researchers also undertook an analysis to determine if any particular stretches of DNA found in African Americans were more often descended from their West African ancestors. The strongest finding was that there are elevated levels of African ancestry on the X chromosome, most likely reflecting a history in which interracial mating primarily happened between mothers with African ancestry and fathers with European ancestry. The African groups studied by the research team represent just a few of the ten ethnicities mentioned most often in slave trade records. Future studies might examine other relevant populations from Sierra Leone, Senegal, Guinea Bissau, and Angola, providing further insights into the genetic ancestry of African Americans.